Certified and Tested Lead and Pthalate FREE! Finished doll is 19 inches long with 3/4 length limbs. What you will receive is unpainted unassembelled soft vinyl doll kit (head,Arms, legs, and flesh tone Doe Suede Body) This is an example of the finished doll kit. The doll kit you receive will be unpainted and unassembled. Please go to the check box to purchase. Certified and Tested Lead and Pthalate FREE!. Eyes are included for Kristen and Katheryn. 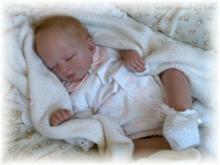 We are offering a Reborn Doll Kit sculpted by the renouned Artist Stephanie Sullivan. Kendall will be 16" to 17" when completed. 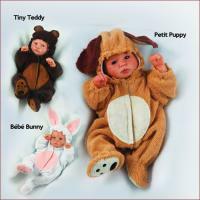 What you will receive is a blank soft vinyl doll kit (head, limbs and flesh doesuede body and cable ties). The photo is the actual sculpt. 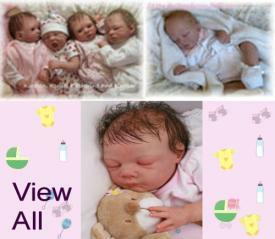 What you will receive is a blank soft newborn pink kit ready to bring to life! This is an unasssembled unpainted doll kit. 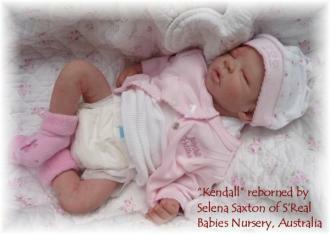 This is an example of what the doll may look like when completed. Go to bottom of page and click the doll kit of your choice.